The layer of thick smog that blankets many of China’s cities is not just making residents sick, it’s also causing premature death. Up to 4,000 people a day are dying due to China’s air pollution. A study by Berkeley Earth that has been accepted for publication by PLOS One took hourly measurements from 1500 stations all over the country over a four month period. While there are many types of dangerous pollution, of concern is a particulate matter named PM2.5 which can penetrate deeply into lungs. These particles can not only cause debilitating diseases like lung cancer and asthma, but they can also trigger cardiac arrest and strokes. About 17 percent of the deaths in China annually are directly attributed to air pollution. That’s 1.6 million citizens killed every year. To blame, according to the researchers: Coal plants. China currently gets about 64 percent of its energy from coal. As part of climate change agreements, China has planned to close some plants and cut carbon emissions, but they’re also building three times as many new ones which claim to be “clean coal” plants—ones which slash CO2 and other emissions. But here’s another scary part of the study. Although these plants are located outside of major cities, the researchers found the particles did not stay localized. 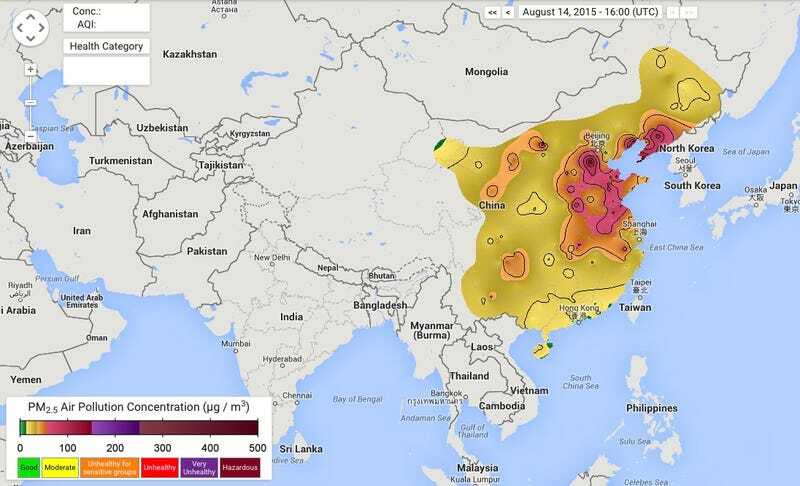 Even cities like Beijing were seeing PM2.5s from distant industrial areas. Here’s a real-time map showing air quality. It’s important to note this is not a problem unique to China. Worldwide, about three millions deaths per year can be attributed to air pollution. The new renewable energy plan from the Obama administration that was announced earlier this month estimated that closing coal plants would prevent 1500 to 3600 premature deaths in the US annually. Obama also said that China was following the US’s lead to slash emissions—let’s hope that’s actually true.